For those unfamiliar with the geography of the Southwestern U.S., the Sonoran Desert is one of its most impressive and desolate features. It is also the backdrop for the excellent debut by Tuscon, AZ death metal band Gatecreeper, Sonoran Depravation, out now on Relapse. Frontman Chase Mason talked to Exclaim! about crossover appeal, the politics of being apolitical and putting down your flag in middle of the desert. "I live in Phoenix and [guitarist Eric Wagner] lives in Tucson, which is about two hours away, so we kinda sent stuff back and forth and we demoed it out on the computer, just me and him, then we show 'em to everybody else. We're definitely a band that accepts technology; we like to use it when we can, which in our case is being able to send stuff back and forth, then we can put it together like a puzzle." 3. Pack your personal history into the music. One of the standouts on the album, "Patriarchal Grip," conjures up both rage at the patriarchy and encourage inciting action against it. However, the song actually references a higher patriarchal presence and examines a spiritual grip rather than a physical one. "My family is Mormon; I was raised in that environment," Mason says. "Those lyrics are based off an initiation or a ritual type thing that happens within that church. The 'grip' is actually like a handshake that they do, it's kind of weird. It's almost like a masonic thing. I took some of the things they talk about in that process and some of the exact phrasing they use and chopped it up into lyrics of that song. I was raised that way and what that [song] talks about, it's being pretty secretive and sacred. I'm sure if my family knew that's what I was talking about, they wouldn't be too happy, but it's personal because it was how I was raised so I write about it." 2. Avoid politics (except for when it comes to shows). "I steer clear of any politics, especially for the band. I don't want to veer into that. It's a terrible political landscape here. There's some pretty radical thinkers, in terms of rebelling, but Sheriff Joe Arpaio, he's a pretty proud racist. I want a place where everyone can feel comfortable. I don't think we do anything actively to promote that, but it's something we definitely strive for in terms of a community around us. Whether it's sexism or racism, none of that is tolerated and it will get run out pretty quickly." 1. Find inspiration in insolation. "Geographically, we're in a weird place. We're technically not the south or the west. There's not even a scene in the Southwest I would say we belong to. That's part of the reason why we named the record Sonoran Deprivation — it's a very specific Arizona shoutout. We wanted to do that because there's not really anything going on here right now. 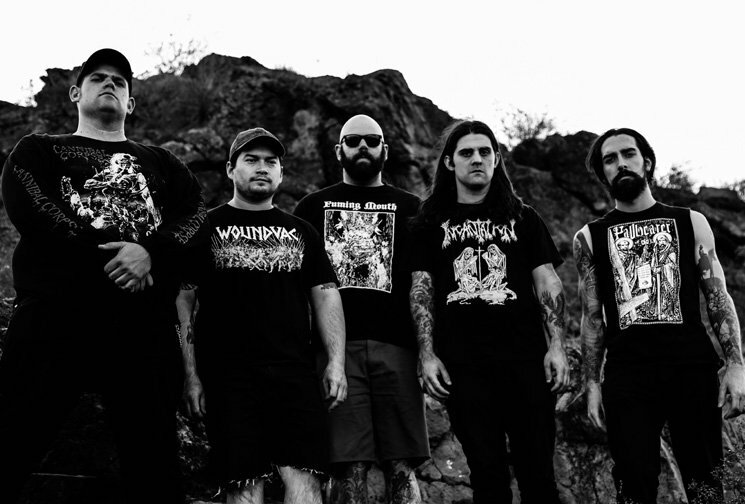 there are good bands — bands we play with all the time — but if you ask anyone outside of Arizona, they're not known for their metal. We're not grouped into metal from the South, so we kinda wanted to put our stick in the ground for our first full-length and hopefully give it a title that represents where we're from and start something up."